Specify the part of the process where the editing element is involved. Three sub-properties for further specification. They include: Iteraction, Phase and Discipline. The stage of the editing element. For example, you may have two class diagrams for modeling a system from design and implementation angles respectively. The two diagrams will have version 1.0 and 2.0 to show the progress of work. The importance of editing element. Status The status of editing element. It is particularly useful for use case and BPMN activity shapes for setting their status such as Proposed, Planned, Tested, etc. Difficulty How difficult it is to complete the goal as modeled by the edting element. Author The person who created the editing element. This is particularly useful in a team working environment. Once the author is known you can contact that person in case you have questions about a part of a model. Create date time The date and time when the editing element was created. This property is a read-only property that is filled automatically to all elements when creation. Last modified The date and time when the editing element was modified. This property is a read-only property that is filled automatically to all elements when the project file is being saved . Further to recording project management properties, you can print those properties in document, too. 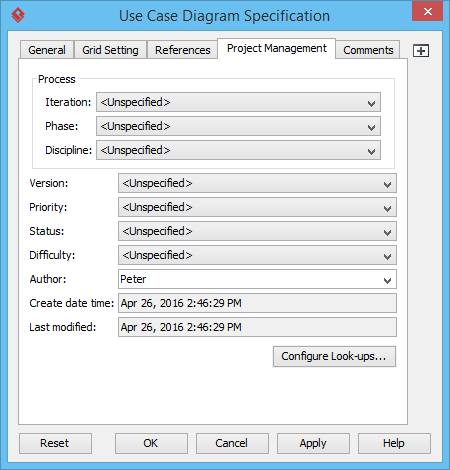 Like all the other specification level properties, project management properties can be edited through the specification dialog box of all diagrams, model and diagram elements. Select the desired diagram/model element/diagram element. Right click and select Open Specification... from the popup menu. Under the tab Project Management you can find the properties of the chosen element.